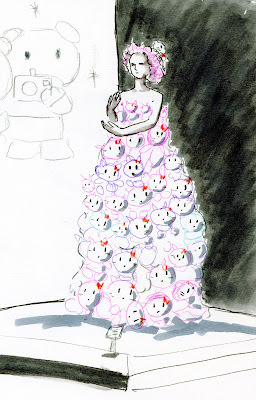 I wasn’t exactly a little girl when I discovered and became enamored with all things Hello Kitty. The Japanese pop culture icon was introduced to the U.S. market in 1975 when I was already in high school, but that didn’t stop me from collecting many red and pink plastic products with the white cat’s likeness. In fact, I was well into adulthood by the time I finally stopped collecting Hello Kitty (and if truth be known, it was only three years ago that I added one more item to that collection). As it turns out, Hello Kitty isn’t so young herself anymore – she turned 40 last year, and as part of that celebration, Seattle’s Experience Music Project Museum brought in the exhibit “Hello! Exploring the Supercute World of Hello Kitty” (subtitle: “Meet the icon that conquered the world in this supercute exhibition”). To be honest, I wasn’t inclined to pay EMP’s steep admission of $24 to see the show, but a friend with an EMP membership knew I wanted to go, so she generously gave me a free pass. Even if I had paid full price, though, I think I would have felt the show was worthwhile. As I saw case after case of coin purses, notebooks, lunch boxes, back packs and more cuteness – much of which I owned at one point (or still own, somewhere in the attic) – the fun and nostalgia fest were worth the ticket price. More interesting was the large selection of new art that had been created in recent years – either inspired by, mocking or satirizing Hello Kitty. By far the most impressive piece was “Super Space Titan Kitty,” a huge sculpture by Colin Christian, which is prominently displayed near the Guitar Gallery in the main lobby that I sketched a few years ago. 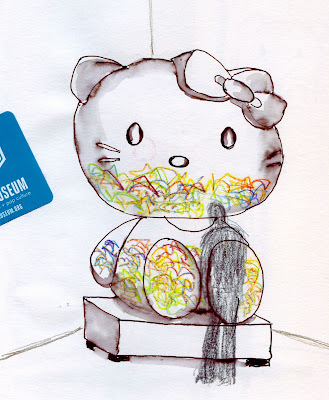 A large transparent time capsule shaped like Hello Kitty is partly filled with notes and cute objects from visitors to the exhibit’s opening. The filled capsule will eventually be sent to the 2020 Tokyo Olympics “to reflect our globe’s cultural diversity and how bringing each of our small universes together can change our view of the world.” The capsule will be opened again in Seattle in 2035. After those two sketches, I was getting hungry, but I couldn’t get lunch without sketching a spectacular dress made entirely of plush Hello Kitties. The dress was worn by Lady Gaga in 2009 for Kitty’s 35th birthday celebration.